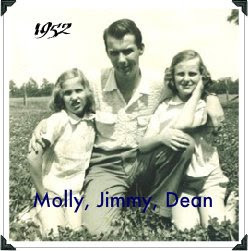 Dean and I grow up on a farm in rural MS in a time that was much simplier and easier going, than it is today. Our Brother Jim, who was 11 yrs older than me and 10 yrs older than Dean, was our best friend and allie, we looked forward to his trips home from Jackson, where he moved when he turned 20. My, how far Jackson seemed to us back then...it is actually only 52 miles north of Brookhaven....I remember crying all day when he told us he had gotten a job and was leaving, I just knew I'd never, ever get to see him again and to a 9 yr old that was just heart breaking...lol..
Sis and I would lay in the big pasture that was covered in white and red clover and day dream the warm southern days away. We used to love to make jewelry out of the clover, you could make such beautiful rings and chains. Then we'd lay back and watch the birds fly over head, the clouds drifting by, you could hear the birds singing and the cows in the distance, no cars or city noises, ever now and then the silence would be broken by the whistle of the train coming down the tracks near our place..and smell the sweet Wisteria, there were 2 vines running up into oak trees next to our front porch one on each side of the front steps, these were so hugh you could use the vine to walk into the tree and swing on the vines like a trapeeze, these were planted by my GD in 1900 when he built the house...when you came down the lane to the farm house it looked like to gaint grape vines intertwined into the large trees, it was a magnificant sight. at the end of the lane was a large 7 Sisters rose vine that covered a large area of the pasture fence...and in front of it were 2 large pear trees. I can almost smell the sweet breezes of spring now as I recall my little peice of heaven. Isn't it funny how when you have Heaven you don't realize it and dream for something else. Well that is what Dean and I used to do, we would lay in the pasture and dream of traveling to far away places and seeing the world....lol...We were going to spend our lives together just traveling the world. Well you know how that always turns out...lol...we both grew up and fell in love with home town boys married raised 3 children each and never left Brookhaven, except for short vacations...our lives got so busy with day to day things that for years we only got to travel with each other to the grocery store or to work, so now that we are both empty nesters we try to spend at least 1 day a month doing something just for us. We still dream of traveling and last year we went to Fl. for 4 days to see our beloved Jim, he now lives in TX with his Daughter, and we are planning a road trip this summer to visit. But for today we are headed to Old Clinton to a new junk-antique store and several stops along the way....lol...I'm sure we will both have sore throats when we get back, but that's alright, for a little while we will be those 2 little girls laying in that pasture day deaming about traveling the world. thanks for visiting. I loved reading your post. As kids we sure have a lot of dreams. It was very touching. Its nice to see that you still have such a nice relationship with your sister. Love your blog. I'm a new follower! Hi Molly, Sorry about your name, as I re-read my comment I went to correct it and it already posted it. Sunday blessings. Morning Molly! Great post, dreaming is a must, isn't it! I am a new follower too and loved reading about you! Hope you have a wonderful day! Hi Mollie, I enjoyed reading as you reminisced about your childhood. Family ties are precious. Well my friend, what a sweet and endearing post! I really enjoyed reading a bit about your childhood and growing up in Brookhaven...sounds like a glorious place to me! I am so sorry to hear that you haven't been feeling well, my friend! Sending lots of good thoughts and prayers your way! I sure do hope that you and your Sis are able to get away on Tuesday! 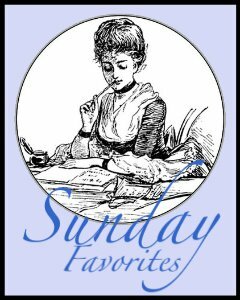 Thank you so much for joining in with Sunday Favorites this week...it was a pleasure! I do apologize at being so late to get by for a visit but I have been so busy just trying to catch up with everything after being away for the weekend! Have a marvelous Monday...and feel better, Molly!